With lots to see and do we welcome you to visit any time of the year. We are open all year with our Bakery making Pies, Breads, Donuts, Cakes, Pastries and more! We also have our Greenhouse stocked with houseplants, Our Gift Department with everything from scarves to candles and everything in between, Vermont & Specialty Foods and a complete Garden Supply Department. Each Season is special at Sam Mazza’s. Spring starts with a burst of color in the greenhouses with all you need for your garden planting needs. Seeds and Seed Starting Supplies, Houseplants, Annuals, Perennials, Hanging Baskets and so much more! Summer brings the bountiful harvest from the fields. Home Grown Produce starts with juicy strawberries in June and is continually changing with the season. Peppers, Cucumbers, Tomatoes, Blueberries, Cabbage, Eggplant and don’t forget the Home-Grown Sweet Corn which is always a favorite too! Summer also brings Pick Your Own Strawberries in June, Blueberries and Raspberries in July. Autumn colors start with stunning Garden Mums and gorgeous Pumpkins. With Gourds, Corn Stalks and more for your fall decorating needs. Autumn is also jam packed with family fun with Hayrides to the Pumpkin Patch to Pick Your Own and the very popular Corn Maze. Winter at Sam Mazza’s is a magical time with Vermont Christmas Trees and Wreathes, Colorful Poinsettias, Vermont Gift Baskets and a well-stocked gift department to ease the holiday shopping rush! June 22nd 11 a.m.-4 p.m. Strawberry Treats, Kids Games, Great Family Fun! Our Famous Apple Cider Donuts & Apple Pie. Different Activities & Food Vendors Every Weekend. 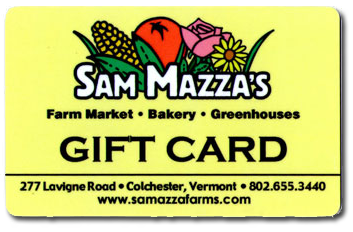 Our Gift Cards make the perfect gift for your friends and family living in Vermont! Our Gift Cards have no expiration date and are valid on any of the wide variety of items available in our store, bakery or even greenhouses!